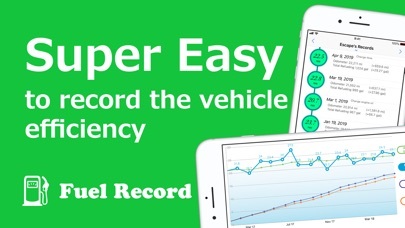 Super easy to record the fuel efficiency of your vehicle. Smart and clear charts. Detailed analysis with easy operation. The number of vehicle registration is unlimited! 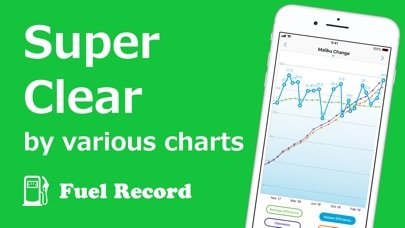 This is fuel efficiency recording app of your vehicle. ● Characteristics of Fuel Record - Input is super easy. 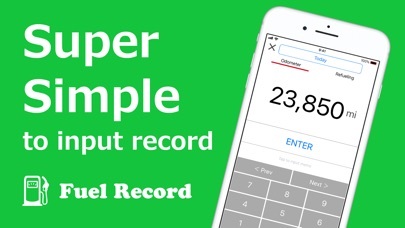 You can enter faster than shooting receipt by camera. - The input result is displayed in charts for easy understanding. - Yearly, quarterly and monthly totaling are available. For example, you can see the seasonal change of efficiency. - The number of vehicle registration is unlimited. You can manage as many as you want. ● This app is like following - This app helps you to record and analyze the mileage and fuel efficiency of your vehicle. - Just input the odometer value and refueling amount when filling the fuel tank up. ● Recommended for people like this - Looking for app to manage easily anyway - Want easy-to-see charts for mileage and fuel efficiency. - To analyze the mileage and fuel efficiency by various totaling way. - To manage many vehicles at once. ● There is also the following functions - The unit of fuel efficiency can be selected from mpg, L/100km and km/L. - You can leave a memo when entering the odometer and refueling amount. For example, this function helps you to keep a log of tire or engine oil change. - Input data can be edited or deleted later. 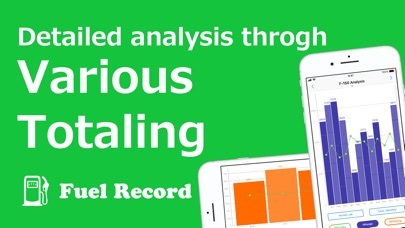 ● Background of Fuel Record development I really wanted a simple app for recording eaaaasily and display mileage and efficiency in cleeeear charts, and I made. If you are also looking for such an app, try this!